WASHINGTON, D.C. — Iowa, South Dakota, Kansas, Oklahoma and North Dakota all sourced more than 20 percent of their electricity generation from wind power during 2016, according to new data from the U.S. Energy Information Administration (EIA). It shows wind supplied over 5.5 percent of electricity nationwide, up from 4.7 percent in 2015. Read the entire release here. Nebraska is one of the top states in the country for potential wind energy generation, with a technical potential of approximately 880,000 megawatts (MW) according to the National Renewable Energy Laboratory. Nebraska now has 1,328 MW of installed wind power. 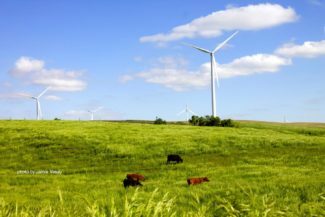 This entry was posted in Nebraska / Midwest News, NewsBlog and tagged American Wind Energy Association (AWEA), economic benefits of renewable energy development in Nebraska, National Renewable Energy Laboratory (NREL), U.S. Energy Information Administration (EIA) on March 6, 2017 by Helen Deffenbacher.